It doesn't matter if I'm coaching tee ball or at the high school level, I realize I will be an important role model for your son or daughter during the season. They are going to look for guidance and instruction, but they will be watching and listening to how I react to every situation. I'm a strong believer that a coach can be one of the most influential people in a young players life. Many players and former players attribute much of their success in life skills to the things they learned through sports. I'm not talking about fielding ground balls, or how to catch a football; I'm talking about teamwork, perseverance, work ethic, having a positive attitude, to just name a few. Skills that not only helped them on the field but helped them in life. Good coaches can help instill a love for the game that can last a lifetime. They keep players interested in continuing to improve and participate year after year. They encourage players to see what they can become. Most of all they keep the game fun. The idea of sportsmanship seems to be lost on many youth players. The fact is, sportsmanship must be taught and observed. If children watch professional sports then their idea of sportsmanship may be to trash talk, spike the ball in the opponents face, or to mimic some other visual statement that demonstrates their superiority. As a coach it's important that you teach the value of sportsmanship. I want my teams to show joy when they make an exciting play, but not at the expense of the player on the opposing team. I want players to always show teammates and opposing players respect. Leadership is the best way to get this across to the players. Interact with the players on the other team. Compliment them when they make a good play. Show your players that you appreciate the other team and the opportunity to play against them. When an umpire or referee makes a poor call, I keep my composure and never use it as the reason for failure. If excuses are offered to players, they will use them every time and stop trying to improve their play. Players need a patient, supportive coach that can teach and motivate in a positive way. If a player is afraid to try and fail, then they will not learn. They must not hear what they did wrong after each failed attempt. They need to know what they did right and what they can do better at next time. Knowing how to be positive and having the ability to communicate with players critical to gaining confidence. I have an easy to remember saying....."Shout Praise and Whisper Correction". Each player needs to know that you care for him as an individual and that you believe he is an important part of the team. Take time to talk to all players individually. Try to take interest in what is going on in their life outside of baseball or football. Fun is essential for kids of all ages. I try to structure practices to actively mix fundamentals to the proper amount of activity. Doing is Fun. Standing is boring. Standing around and listening or waiting is not fun. I try to involve as many coaches as I can to keep the activity level high. Players want to improve and gain new skills. Make sure that you challenge all your players at an appropriate level to improve their play. This may require that players focus on different skills than other players during practice. I try to recognize their improvement often, and in front of the other players when appropriate. I keep practices and games organized and communicate expectations clearly. If rules are made and then broken, an appropriate consequence must follow. I always have a rule about talking when I'm talking during practice. It is difficult for young kids to maintain their focus during practice, since they are easily distracted. When I'm explaining something to the players, I expect to have their eyes on me and paying attention. I use the "Ready.. Focus" method to. If a player interrupts or starts talking to other players, I tell them to focus on me. If it continues, I will sit that player down for a short period of time and let them watch for awhile. Occasionally, I may sit a player trying to become the team clown and distract other players. I rarely have a player sitting on the side after the first couple of practices. In Mike Krzyzewski's book 'Leading With The Heart'. "When teaching, always remember this simple phrase: 'You hear, you forget. You see, you remember. You do, you understand." I try to avoid talking too much, without showing and having the players do. Unlike teenagers, kids do not learn from the mistakes demonstrated by others. They will learn from their own mistakes only. This is why it is important to avoid drills in practice with long lines of players waiting for their turn to "do and learn".... They will typically repeat the same mistake another player did 30 seconds earlier. Coaches that believe winning is "everything" have only one direction to take the team...down. Winning is the goal, and makes playing fun, but these kids are not professionals. The primary goal is to emphasize attitude and effort. A successful season can be achieved without a league championship. Winning games will take care of itself if they are prepared, play as a team, and always give their best effort. I have seen many coaches who know finer details of technique and execution fail at the youth level because they were poor communicators. They may know baseball or football, but they don't have a clue when it comes to publishing schedules, expectations, team rules, etc. They forget that kids don't drive themselves to places. The typical family has a busy schedule usually involving the kids school, parents work, and activities of brothers and sisters. Expecting a family to learn of a schedule change on a week by week basis is crazy and will lead to frustration of the parents, players, and other coaches. I will publish a season schedule and handle expectations to this schedule are true exceptions. 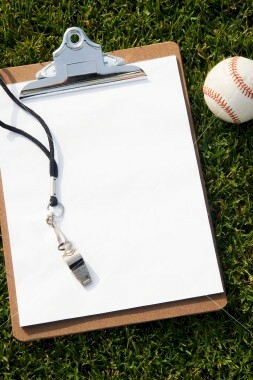 By communicating the schedule far in advance, I also hold players accountable for attending and being punctual. Copyright © 2007 CoachWard.com All Rights Reserved.